When it comes to chicken coop plans and designs the sky’s the limit. You can go with a functional rectangle that keeps your feathered friends safe and dry, or you can enhance your outdoor space with a cool design. There are also different choices for the construction of your chicken coop. You could have a professional come out and build one for you, but that can take some of the fun out of the hands-on aspect of owning chickens. If you’re really crafty, then you can find the chicken coop plans online, buy the supplies and build it yourself. There is even the option of choosing a DIY chicken coop that comes in a handy kit. They’re more affordable than professional services, and they’re far easier than trying to construct one from scratch. When it comes to chook pens, you need a few things. Access to the ground is still vital so that they can stretch, scratch and look for food. All of these needs can be met with a basic box design, but a home with a view is more fun for everyone. This design is called the Chalet Timber Aviary and features an adorable little house with a gabled roof. The home opens up into a large screened area where the birds can get some sun without worrying about the neighbourhood critters. There’s an easy access laying box, built in perch a handy little ramp for the birds to get in and out. It’s functional and attractive. Why not draw up a list of what you need and give this design a shot! Sometimes a simple design is all you need. This little box design is called the Chook Shed. It features a tall gabled roof and large screened windows on the front wall, it’s a great choice for beginners. Best built out of pine weatherboards and topped off with a steel roof which you can get at your local hardware store. Why not add a little-fenced area to give your chickens some supervised time out in the yard. Everyone loves a covered porch, including your chooks. Big is always better. 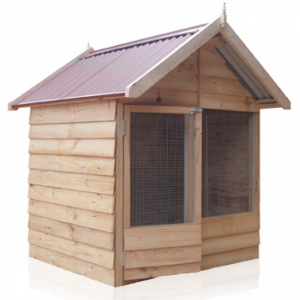 This is one of the most attractive chicken coop designs and called the Eucalypt Aviary. This rectangular unit features solid wood walls on the back half with screening on the front half. 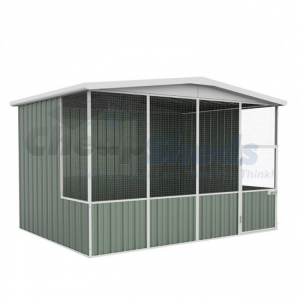 The metal roof spans the entire unit to give your birds more protection from the elements. If you haven’t done a chicken coop before, you’ll find copying this design is easy. 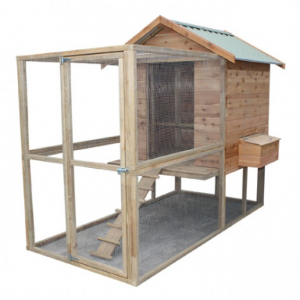 If you’re working on a tight budget and want to keep this cost down, then simplified chicken coop plans will suit your needs nicely. 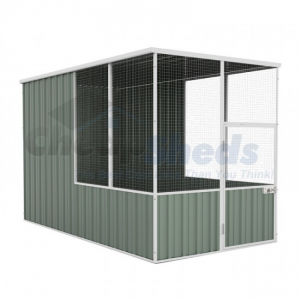 Simple aviaries are made of all steel components that are very affordable to buy and easy to maintain. 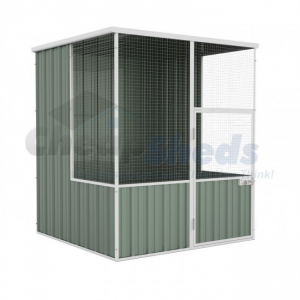 A basic rectangular style, this coop makes it easy for you to see the chickens while ensuring that they’re safe. You’ll also appreciate the 30-year written warranty that comes with this unit. They’re available in a range of sizes, so you can accommodate a few chicks or a full brood. When it comes to your chook pen, you can easily assemble one yourself using a DIY kit. A backyard chicken coop can keep your pets safe, and you don’t have to spend a small fortune on a professionally constructed pen. When it comes to building a chicken coop, you can simplify the entire process with one of our kits. 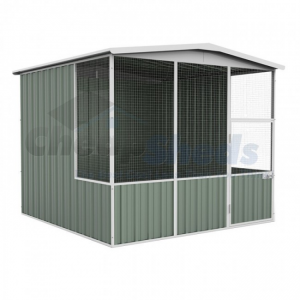 We can provide you with the right chook pen for your needs, and we want you to be completely satisfied with the results. You will get instructions on how to construct your chicken coop, and we’ll even give you tips on the maintenance. Give your birds the protection and care they need, and let us help you save money in the process! I don’t know why but I have always loved the concept of getting the chooks off the ground with regards to the best design for a chicken coop. There is probably no warmth or security benefit but still my favourite. Hi Jordan, thanks for the message, For some reason I missed it earlier! I know what you mean, I love the Chalet timber aviary with its little ramp. Having them off the ground could benefit them in hot summer and also keep the floor dry during wet weather. Also harder for little critters to get in if they happen to get through the mesh. Anyways Im sure one can insulate and warm those coops during super cold weather, timber coops have always been popular to keep chooks in.